Fruit makes up an essential part of a balanced diet, and it should be a staple in your MyPlate meal plans when you're trying to lose belly fat. Exactly how much fruit you need depends on your age and gender, but you should aim for 1.5 to 2 cups each day, under USDA ChooseMyPlate guidelines. While no single food melts belly fat -- and it's impossible to lose weight only from your belly, instead of all over your body -- some fruits are particularly rich in nutrients that help with fat loss. When you're trying to lose weight, berries offer nutrients that might help. They're an especially rich source of dietary fiber, a special type of carbohydrate. Fiber helps fill you up, but it's not broken down into calories, so it helps you feel satisfied after your meal without boosting your calorie intake. Simply eating a diet richer in fiber is enough to trigger significant weight loss, according to a 2015 study from the Annals of Internal Medicine. 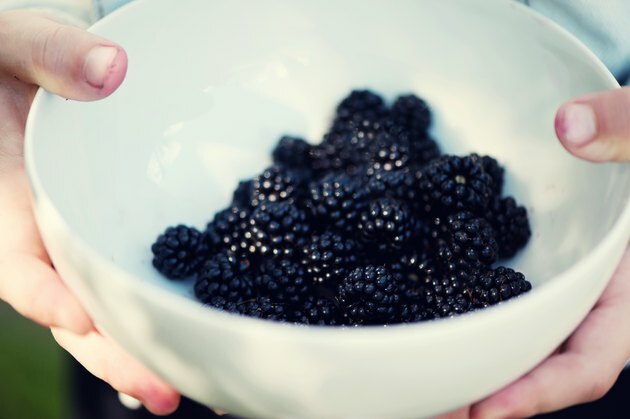 A cup of raspberries or blackberries has 8 grams of fiber, which is just shy of one-third of the daily value. Strawberries also offer a significant amount of fiber -- 3 grams, or 13 percent of the daily value, per cup. Reach for apples as a weight-loss-friendly fruit. A seven-year dietary survey, published in Nutrition Journal in 2015, looked at the diets of more than 13,000 children and adolescents and found that apples were linked to a lower risk of obesity. Apples also come packed with dietary fiber, although you'll get the most fiber if you leave the skin on. A large apple, with skin, has 5 grams of fiber -- 22 percent of the daily value -- which is twice the amount of fiber found in a large skinned apple. And because apples travel well, they can help you stick to your diet -- if you carry one in your bag, you'll always have a healthy snack on hand, so you're less likely to head to the vending machine to quash an unexpected hunger pang. Most fruits and veggies offer some vitamin C, but citrus fruits are especially rich sources. Getting enough vitamin C is important for fat loss, since it appears to play a role in fat burning when you work out. One 2006 study, published in Nutrition & Metabolism, reported that low vitamin C levels can reduce the amount of fat you burn during aerobic exercise by 25 percent. Correcting your vitamin C levels, however, can restore normal fat burning during exercise. One large orange has 163 percent of the daily value for vitamin C, while half a large grapefruit provides 95 percent of the daily value. Even smaller citrus fruits have a significant amount of vitamin C. One large tangerine, for example, provides 53 percent of the daily value. While certain fruits are higher in fat-loss-friendly nutrients than others, the most important thing is to eat lots of fruits and veggies, period. Simply eating more fruits and veggies lowers your risk of obesity, notes a 2015 study published in PLoS One. Add a handful of chopped fruit to your oatmeal -- try a mix of chopped orange and cranberry, or apples and strawberries -- or add a handful of berries to your favorite salad. Add sliced fruit to sandwiches -- thinly sliced apple works well in a turkey sandwich, while sliced grapes can add sweetness to chicken salad -- or enjoy fresh or frozen fruit on its own. Keep in mind that the only way to lose weight is to eat fewer calories than you burn each day. While fruit is healthy, eating several cups of it each day will add up. Practice portion control so that you're not eating more than the USDA ChooseMyPlate-recommended fruit intake for your age and gender, and stick to a calorie-controlled diet to lose your belly fat. What Is a Serving Size for Fruit?